Natural control strategies that employ biological agents for pest suppression are generally classified as biological control tactics. In conventional usage, this term usually refers to the practice of rearing and releasing natural enemies: parasites, predators, or pathogens. A slightly broader definition of "biocontrol" includes any related management activity that is designed to protect or conserve natural enemies. Importation. Foreign exploration is conducted to identify and collect natural enemies in the country from which an exotic pest has been introduced. Following the discovery of a potential biocontrol agent, it undergoes extensive evaluation to insure that its ecology and host range are compatible with the community to which it will be introduced and that it will not become a pest once it is released. Suitable candidates are reared and released in the new habitat in hopes that they will become established and suppress the pest population. Conservation. A variety of management activities can be used to optimize the survival and/or effectiveness of natural enemies. Conservation activities might include reducing or eliminating insecticide applications to avoid killing natural enemies, staggering harvest dates in adjacent fields or rows to insure a constant supply of hosts (prey), or providing shelter, over-wintering sites, or alternative food sources to improve survival of beneficial species. Augmentation. 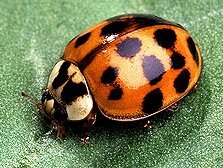 Natural enemies that are unable to survive and/or persist in a new environment can sometimes be reared in large numbers and periodically released to suppress a pest population. In some cases, small numbers of a beneficial species are released in several critical locations to suppress local pest outbreaks (an inoculative release). In other cases, larger numbers are released in a single location to flood the pest population with natural enemies (an inundative release). Narrow host range. Generalized predators may be good natural enemies but they don't kill enough pests when other types of prey are also available. Climatic adaptability. Natural enemies must be able to survive the extremes of temperature and humidity that they will encounter in the new habitat. Synchrony with host (prey) life cycle. The predator or parasite should be present when the pest first emerges or appears. High reproductive potential. 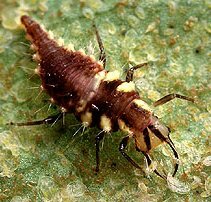 Good biocontrol agents produce large numbers of offspring. Ideally, a parasite completes more than one generation during each generation of the pest. Efficient search ability. In order to survive, effective natural enemies must be able to locate their host or prey even when it is scarce. In general, better search ability results in lower pest population densities. Short handling time. Natural enemies that consume prey rapidly or lay eggs quickly have more time to locate and attack other members of the pest population. Small populations of efficient natural enemies may be more effective biocontrol agents than larger populations of less efficient species. Survival at low host (prey) density. If a natural enemy is too efficient, it may eliminate its own food supply and then starve to death. The most effective biocontrol agents reduce a pest population below its economic threshold and then maintain it at this lower equilibrium level. Just as predators and parasites may serve as effective biocontrol agents for insect pest populations, so insect herbivores have also proven effective as agents for controlling weed populations. Feeding injury by herbivores may weaken a plant or increase its susceptibility to disease, desiccation, freezing temperatures, or other herbivores. In any case, an injured plant is likely to be a poor competitor, and in time, beneficial species will have an opportunity to reclaim the vacated space. Control of the Klamath weed (Hypericum perforatum) and the prickly pear cactus (Opuntia spp.) are two well-known examples of successful weed control using insect herbivores. Biological control is a particularly appealing pest control alternative because, unlike most other tactics, it does not always have to be reapplied each time a pest outbreak occurs. Once natural enemies are released into a new environment, there is a good chance they will become established and provide a self-perpetuating form of control. Biological control is also the only control tactic that increases, rather than decreases, the species diversity within an agroecosystem. This increased diversity often results in greater stability because wild fluctuations in population density are less common in communities with a diverse food web. 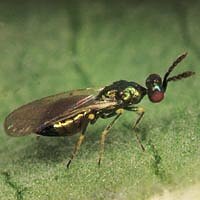 Parasitic wasp Biological control is not a "quick fix" for most pest problems. Natural enemies usually take longer to suppress a pest population than other forms of pest control and farmers often regard this as a disadvantage. It also may be difficult to "integrate" natural enemies into a crop or commodity when pesticides are still in use. Beneficial insects are often highly sensitive to pesticides and their resurgence (recovery to pre-spray densities) is usually much slower than that of pest populations. Rapid pest resurgence often leads to a vicious cycle of continued chemical usage that prevents natural enemies from ever becoming reestablished. Perhaps the greatest potential for future progress in biological control lies in improving the success of microbial pathogens. Many of these organisms are highly desirable as biocontrol agents: they attack a narrow range of insect hosts, they are not hazardous to humans or domestic animals, and they do not pose a threat to the environment. As a group, though, pathogens have never proven to be quite as reliable as other forms of pest control. They are vulnerable to desiccation, ultraviolet radiation, and high temperatures. They may not survive long enough in the environment to encounter a host, and even if they survive, their virulence may be too low to overcome the host's defenses. In the past few years, however, there has been encouraging progress in the development of microbial insecticides. These are commercial suspensions of spores, toxins, or virus particles that can be mixed with water and sprayed onto crops just like conventional insecticides (see Table 2). In many cases, microbial insecticides are better than conventional insecticides because they suppress pest populations without eliminating natural populations of predators and parasites. A great deal of research is still needed before we can begin to benefit from the full potential of biocontrol. Fortunately, new developments in biotechnology may soon enable us to create new strains of microbial pathogens that are more virulent, easier to mass produce, and less sensitive to temperature and humidity. Work is currently underway to transform a common soil microbe, Pseudomonas fluorescens, into a pathogen of soil-dwelling insects by implanting the delta-endotoxin gene from Bacillus thuringiensis. Clearly, there are major changes in biocontrol that lie just over the horizon.